For my brother's birthday cake, I wanted to make something fresh and light, since it was just the beginning of spring. We also had a busy day planned, so I had to choose a recipe that could be made in a few hours, without lots of different steps or fillings/frostings. 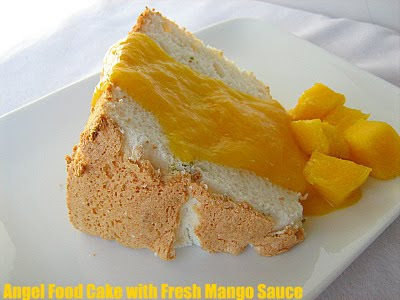 My brother loves mangoes and limes, and I had tons of egg whites in the freezer, so I decided to make an Angel Food Cake. I decided to flavor it with lime zest and then use the fresh mango sauce from Ellie Krieger's new book as the topping. I figured the lime and mango go well with ginger, so the cake and sauce would compliment the ginger ice cream. Everyone loved the cake and the mango sauce. I thought the mango sauce overpowered the delicate cake a little bit and preferred the flavor of the cake plain, the next day. I doubled the mango sauce because I knew my brother would probably want to eat it plain. I decreased the amount of sugar in the sauce too, because our mangoes were really flavorful and sweet. I used some of the leftover sauce in a really fun muffin, but that will come later. 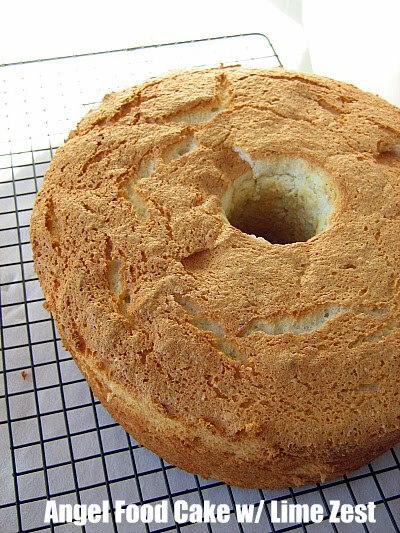 I don't know if you have ever made an angel food cake from scratch, but they are so delicious. One from a box mix or from the store just can't compare. I am definitely hooked. In a blender or food processor, process half the mangoes with the lime juice and sugar. Dice the rest of the mangoes. Serve with angel food cake. When my family was here visiting a couple of weeks ago, my youngest brother turned 18. I was really excited about his big day because that meant I could make cake and ice cream! I decided to use a couple of my brother's favorite flavors. He loves lots of things and ginger is one of them. My mom used fresh ginger root a lot in dishes growing up, so my whole family is quite familiar with its zing. I found some crystallized ginger at EarthFare in the bulk section, which was much more affordable than the small bottles of it I have bought at other grocery stores before. Don't you love it when that happens? I know I do. I had already bookmarked this particular recipe a few months ago, so I was excited to finally have an occasion to make it for. The ice cream turned out perfectly- smooth and delicious, with that spicy bite that fresh ginger adds. The pieces of crystallized ginger added the perfect little something. 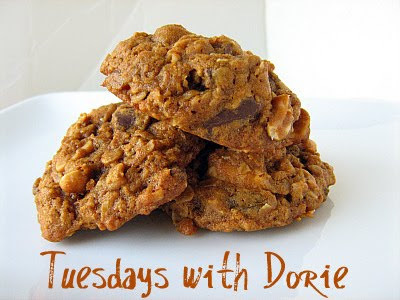 This week's Tuesdays with Dorie recipe, Chockablock Cookies, was chosen by Mary over at Popsicles and Sandy Feet. You can find the recipe on her blog. Honestly, I was going to skip this recipe. 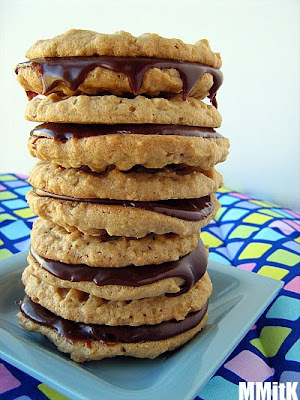 Cookies aren't my favorite thing to make and there wasn't a picture of these to entice me. They sounded fine enough, with tons of mix-ins, but I just didn't know. Plus, they call for shortening, which is a no-no for me. Meaning, I don't ever have shortening on hand because I don't buy it. I wasn't about to go and buy shortening just for a cookie. Then I decided- why not? Playgroup was the next day, so I could just take them as a treat for the kids. I mixed these up and let the dough sit in the fridge for about 30 minutes, while I put my kids to bed. I made 1/2 of the recipe and got 25 cookies. I used golden raisins, peanuts, coconut and chocolate chunks as my mix-ins. I let them cool, plated and wrapped them for the next day and went to bed. I was curious about the molasses flavor and I tried one out of pure curiousity. Plus I figured that since my cookies were somewhat small and I had only used 6 Tbls of butter for 1/2 the recipe, that each cookie only had 1/4 Tbls of butter, which makes it sound perfectly okay to consume a cookie. Don't you love how much thought goes into whether or not I can try a cookie? HA! I thought that the molasses flavor was almost non-existent, except when a bite w/out a chocolate chunk was taken. Then it was faintly in the cookie. These turned out to be pretty good. Someone at playgroup thought they tasted like trail mix cookies. Some kids just ate them. Some picked out the raisins. Some picked out the nuts. My picky son ate them with no complaints and no removal of ingredients, which surprised me. So, overall I thought these were a success. Not something I would have picked to try without the help of other TWD'ers, but something that I will make again. 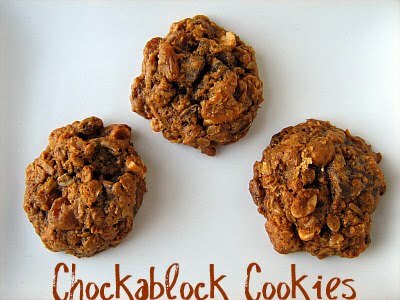 Go see what everyone else thought about these loaded cookies by checking out the TWD Blogroll! Please excuse some of these photos lately! When my family was visiting from Utah, I really didn't take the time to get a good picture of some of the recipes that I really wanted to share. 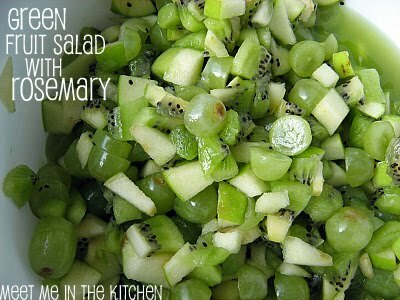 I tasted this at a recent book club get together and knew there was a secret little something in the fruit salad besides the green apple, kiwi and green grapes. I asked the hostess what is was and quickly decided that I would definitely be making this at home. A Rosemary simple syrup was the secret ingredient that added that punch of flavor. I used the simply syrup recipe that I have used with other fruit salads before that is usually flavored with citrus juice and zest and just added fresh rosemary sprigs instead of the citrus. I just guessed on the number of fruits to use, so if you want more green apple or kiwi or grapes, feel free to add more of that fruit. It might sound like a crazy combination, but it is so amazing. I took this salad to one of our family dinners and everyone raved about it. Combine sugar, water and rosemary in a small saucepan. Bring to a boil; remove from heat and let cool. Refrigerate until chilled. Combine chopped fruit in a large bowl. Strain the rosemary from the syrup and add the syrup to the fruit. Stir to combine and chill until time to serve. I know everybody out there has at least one dish that their mom makes better than anyone else in the world. My mom has many, but when it comes to potato salad, I can only eat my mom's. I don't like mayo anyway, so if a potato salad is just mayo based- no way am I going to eat it. This recipe has lots of mustard, so the flavor is a little bit different. My mom also makes this with plain yogurt occasionally, which I prefer. I also don't like potato salad that has too much dressing/sauce. I prefer drier potato salad. This particular time that we made the potato salad together, my mom said it was too "wet". When my family was in town visiting we served dinner at the homeless shelter and my mom made her potato salad. We found a good deal on red potatoes, that had a yellow-y flesh, so that is what we used here, but usually a normal baking potato does the job. Because we used red potatoes and the skins were tight, we didn't peel them. Potato salad is not something that I eat more than once or twice a year, but I know lots of people enjoy it during the summer, at picnics and cook-outs, so it fits with this time of year. My dad would eat this everyday if he could. Dice egg whites; set aside. Mash yolks with mustard; stir into mayo/yogurt along with sugar, salt, and celery seed. 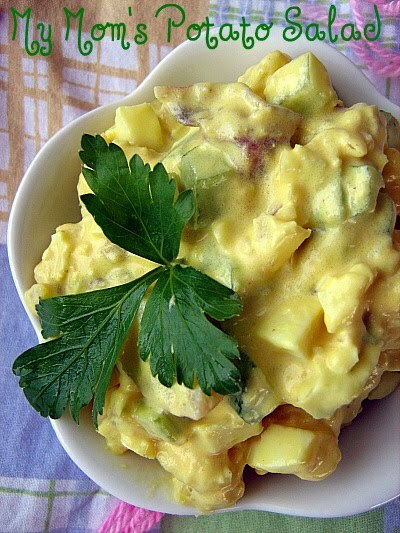 Combine mayo mixture with potatoes, onions, egg whites, and pickle relish. Cover bowl and chill for several hours before serving. When my parents and siblings were here visiting from Utah, we all went to the Georgia Aquarium one day. My sister and her family were also down here, visiting from Washington, D.C., so it was quite a bunch of us checking out all the aquatic life. It was really fun, but after a long day in Atlanta, we came home and were all a little tired. I had planned on making this soup when my family was visiting anyway, so this night seemed like the perfect night to make a easy soup that would be ready fairly quickly. (which is where I get all my bulk items like quinoa, lentils, steel-cut oats, bulgur, millet, couscous, specialty flours, dried fruits, nuts, nut butters and also some of my dairy and produce) so, I decided to use them in this soup since that is what Ellie calls for. We all thought that green lentils tasted about the same as brown lentils, but they held their shape better, which gave them a little bit better texture. I didn't have enough chicken broth in my pantry, so we also used about 6 cups of water, but it worked out fine. I also added the zest of an entire lemon since I believe that more zest is always a good thing. We probably used more kale than called for too. We just kept on tearing it up and dumping it in the pot without measuring it. The fresh lemon juice and lemon zest really brightened up this soup and added a little extra something to it. This soup was the perfect way to finish a long day. We had Kale Chips and Cheese Toast on the side. Heat the oil in a large pot over medium-high heat. 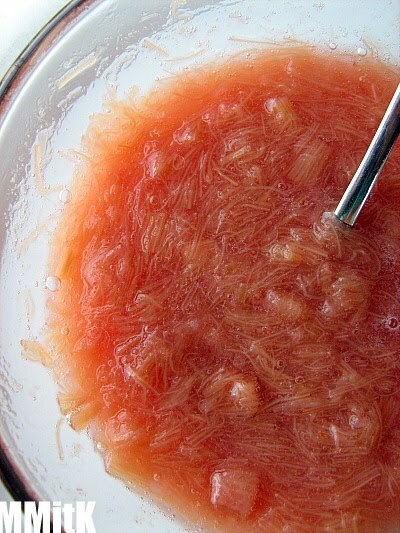 Add the onion and cook, stirring, until softened and translucent, 3 to 5 minutes. Add the carrot, celery and garlic and cook, covered, stirring occasionally, until the carrots are softened, about 5 minutes. Add 12 cups of broth, lentils, basil, thyme and salt and bring to a boil. 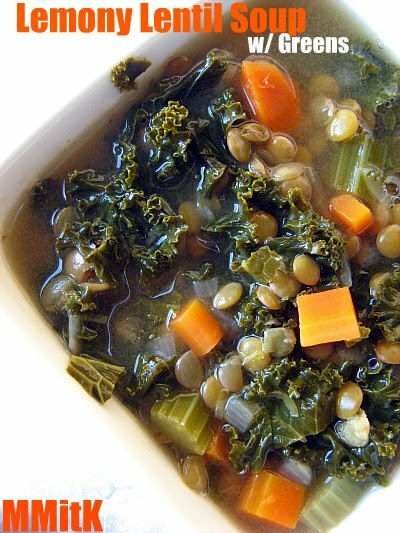 Reduce heat to low, add the kale (spinach) and cook until lentils are tender, 30 to 35 minutes, adding more broth if necessary. Stir in the lemon juice and zest, and serve. Sometimes I feel like there are way too many treats on my blog! But, I love to bake, so whenever I get the opportunity to make something for a dinner or event- I bake away. Just know that my family is not eating all of the sweet things featured here. We are sharing with the world! So, with that being said- recently we had an event at church and I was in charge of the dessert. Strawberries were just coming into season and I decided to give Martha Stewart's strawberry cupcakes a whirl. Since it was going to be only women at this event, I decided to make mini cupcakes. That way, everyone could try one and not feel the least bit guilty about it. This recipe makes a ton of batter. I got 70 mini cupcakes and made a dozen normal size cupcakes to give away. So, be warned! I frosted them with whipped cream that I flavored with pureed strawberries and it went perfectly with this delicate, delicious cupcake. Many of the women at this event told me that these were the best cupcakes they had ever eaten. That has to mean something. I saved one of the normal-sized cupcakes for my family that was coming into town the next night and they said the same thing. For the whipped cream, I used 2 cups of cream. I coarsely chopped strawberries, about 1 1/2 cups and then pureed them in the food processor. Whipped the cream to soft peaks, then added vanilla, powdered sugar (to taste) and whipped the cream to stiff peaks. I folded the strawberry puree in at the end. Everytime we make dinner to serve at a local homeless shelter, I make sure to choose something fairly easy for dessert. Bar cookies are just about the easiest thing to bake, in my opinion. 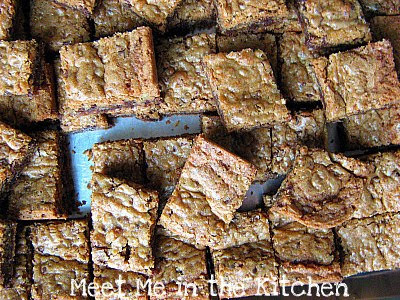 These particular blondies are full of just about everything. Chocolate, nuts, Heath bits, and coconut, make for a lot of add-ins. I have seen them on other blogs over the past couple of years, but can't remember exactly where. 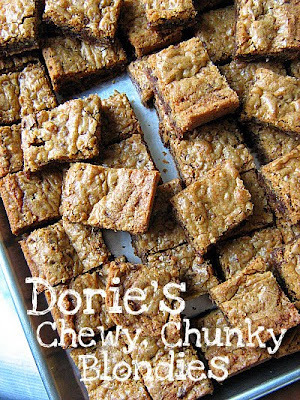 I knew they would be good, just because they were Dorie's recipe, so I made 2 huge batches and ended up with an enormous amount of blondies. Usually we don't have a single drop of food leftover, but somehow I managed to bring 1 or 2 of these back home. My hubby was happy to sample them and of course, was hoping that there were more to be found. He was disappointed to know that they were all gone. We have a definite crowd pleaser right here, folks! Getting Ready: Center a rack in the oven and preheat the oven to 325 degrees F. Butter a 9×13-inch baking pan and put it on a baking sheet. Working with a stand mixer, preferably fitted with a paddle attachment, or with a hand mixer in a large bowl, beat the butter on medium speed until smooth and creamy. Add both sugars and beat for another 3 minutes, or until well incorporated. Add the eggs one by one, beating for 1 minute after each addition, then beat in the vanilla. Reduce the mixer speed to low and add the dry ingredients, mixing just until they disappear into the batter. Using a rubber spatula, stir in the chips, nuts and coconut. Scrape the batter into the buttered pan and use the spatula to even the top as best you can. 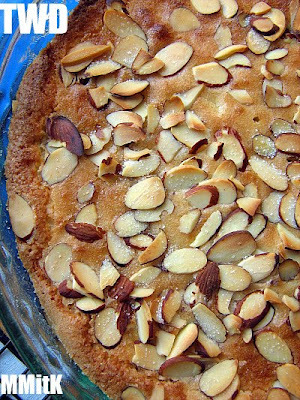 Bake for about 40 minutes, or until a knife inserted into the center of the blondies comes out clean. The blondies should pull away from the sides of the pan a little and the top should be a nice honey brown. Transfer the pan to a rack and cool for about 15 minutes before turning the blondies out onto another rack. Invert onto a rack and cool the blondies to room temperature right side up. Cut into 32 bars, each roughly 2-1/4 x 1-1/2 inches. This is another great recipe from the Mayo Clinic Cookbook that caught my eye, even though there was not a picture provided alongside the recipe. Kind of disproves something I said the other day about pictures being the inspiration for the dishes I choose to cook and bake, but oh well! I love anything that has curry in it. Curry powder, curry paste- whatever it is, I love it. My mom used curry powder in quite a few dishes when I was growing up and I think that is probably part of the reason why I love it so much. I made this to take to a family dinner as a side dish and it was well liked by everyone which meant I didn't get as much of it leftover throughout the week for my lunch, but at least it was a hit. 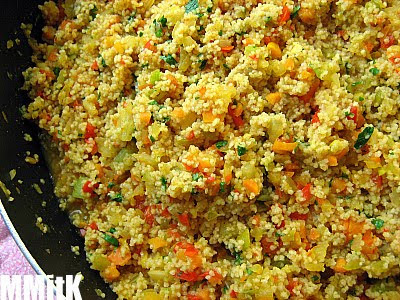 It uses whole wheat couscous, which is almost exactly the same tastewise as normal couscous. Meanwhile the couscous cooks up and then you throw the whole thing together. It was so easy and really delicious. I am going to try it again with quinoa or millet and can't wait to eat it again! This week's TWD recipe was chosen by Melissa of Love At First Bite. She chose Sweet Cream Biscuits. You can find the recipe on her blog. 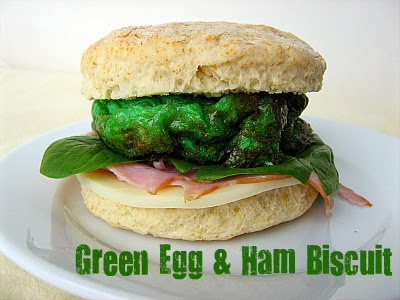 The recipes for April just happened to be posted the day before St. Patrick's Day and I was already planning on making some version of green eggs & ham for my kids with biscuits. I decided to use Dorie's biscuits as the base for our Green Egg and Ham Biscuits that we had for dinner. Sorry if the green eggs disgust you, but my kids love it. I just use a little bit of food gel coloring to get our eggs nice and green. Usually I add chopped ham to our eggs and scramble them, but this time I decided to bake the eggs in muffin tins, then add slices of ham and cheese to the sandwiches. I didn't have a lot of luck with these biscuits. They turned out fine, but I would've liked it if they would have had more height. I didn't add enough cream at the beginning and it was too late to make the dough the right consistency by the time I realized it. They were still soft and yummy, just short. 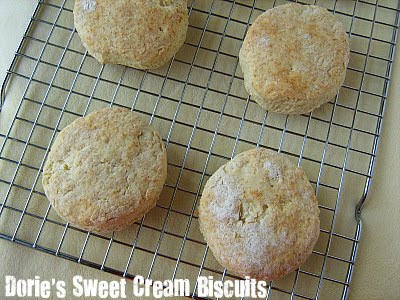 I have had more success with Cooking Light biscuits than any full fat biscuits I have tried baking for some reason. That being said, my son LOVED these biscuits. He ate almost all of them by himself. He loved them completely plain and also made into a green sandwich. So that makes them a success, I guess! Check out the TWD Bakers to see what everyone else thought about these biscuits! Pictures are often the reason that I want to try certain recipes. Cookbooks and magazines are fun for me to look at and pictures of certain recipes will make me want to try them. That is what happened here. Partly. I saw the picture for this recipe in Food Network Magazine and was happy about the word Spring in the title. Plus, it looked yummy. This time of year always makes me want to eat more salad, so everytime I find a good salad recipe that the entire family enjoys I am excited. I also happened to have most of the ingredients for this salad on hand, which is unusual since I don't usually have potatoes in the house. I liked that the dressing was made with greek yogurt, which is something that I usually sub for mayo, so the fact that it was already in this recipe made me happy. I don't really love fresh tarragon, simply because it has that anise/licorice flavor, but in this salad it wasn't too strong since it was mixed with the fresh chives. It was subtle enough that I didn't mind it at all. This was a super fast dinner, that didn't require any cooking, which is always appreciated by me on a weeknight. I used some cooked turkey breast that I had in my fridge instead of chicken. I also reduced the olive oil by 1/2. Quick and delicious! I have mentioned before that any vegetable is delicious when you roast it in the oven. It really is true. 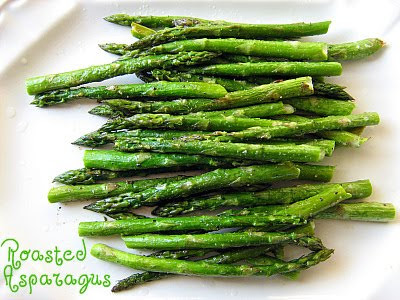 I have roasted asparagus in the oven quite a few times and decided to roast some for our Easter dinner since it is in season right now and very affordable. Plus my 5-yr old daughter has decided that asparagus is her favorite vegetable and so we have to have it at least once a week. Preparing asparagus this way couldn't be easier. It does take a few more minutes than steaming or blanching, but you won't end up with limp, soggy asparagus if you leave it in the oven for an extra minute as opposed to the other ways of preparing it. The texture is better because it still has a little bit of crispness to it, but it is completely tender at the same time. You could also use other seasonings, like garlic, chili flakes or other herbs if you wanted to. There were a few people at Easter dinner who hadn't tried asparagus this way who were quite intrigued by the method since it produced such delicious results. Place asparagus on baking sheet in a single layer. Drizzle with olive oil. Season with salt and pepper. Toss to coat evenly. 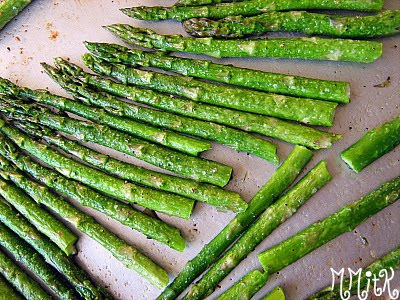 Roast in oven for 12-14 minutes, or until asparagus stems are tender when poked with a fork. Squeeze lemon juice over asparagus and serve. 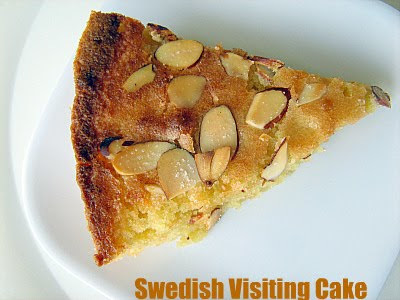 This weeks TWD recipe, Swedish Visiting Cake, was chosen by Nancy who blogs over at The Dogs Eat the Crumbs. I love Nancy's blog. She always gives such great descriptions of the dishes she makes and I have used countless recipes and pieces of advice from her. You can find the recipe on Nancy's blog and I think you will want to find it because this is as simple and delicious as cakes can get. I made this for our Easter dinner. It was so easy. Everything just mixed quickly in a bowl and then was ready to be baked in a cast iron skillet. I don't have a cast iron skillet, so I used my pyrex pie pan, which was one of the alternate baking pans that Dorie suggested using. The only problem I had was that the cake didn't get very brown on the top or the bottom. I wanted the top to be nice and brown, so I put it under the broiler for a few minutes. I should'ved watched it closer because it got a little too brown, but at least it didn't burn. Everyone loved this cake. 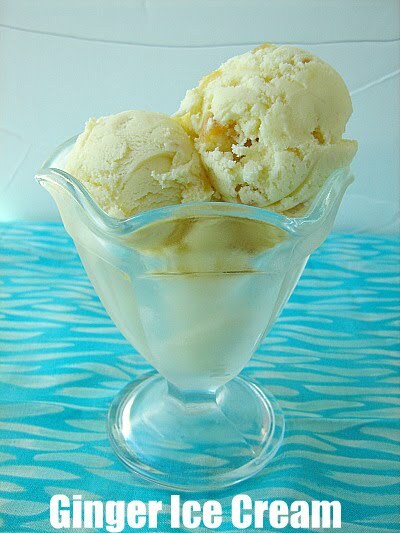 It had great almond flavor and the lemon zest added a little extra zing which was really nice too. 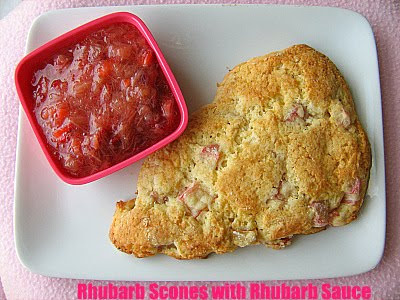 I will definitely be making this again because it is simple, quick and so yummy! Go check out the TWD Blogroll and see what everyone else thought about this cake! One of the best things about living where we do, is the fact that we are close to grandparents. It is so fun for the kids to know them and to be close enough to see them frequently. Recently Papa had a birthday and the girls wanted to make him a treat. We had a busy morning, so we decided cookies were the item to be gifted. Papa loves chocolate and I had some milk chocolate ganache (leftover from these cupcakes) in the fridge that needed to be used, so I just had to find a cookie that would do the job. 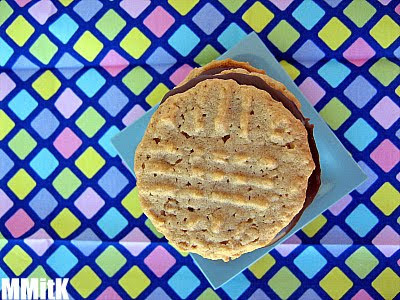 I remembered this PB cookie recipe from a magazine and decided to switch out the PB & J filling the recipe called for and used the milk chocolate ganache instead. The cookies were quick and easy to mix up. I used creamy PB instead of crunchy. I warmed the ganache slightly, slathered it on a cookie and then smooshed another cookie on top. Then the cookie sandwiches were ready to go. The girls made some cute birthday cards and we took the treats over to Papa's house. They were enjoyed by those who tasted them. I let my girls try a cookie plain and they thought the cookies were great. So there you have it. Another successful birthday treat! For the ganache I just heated some heavy cream in a saucepan and then mixed in milk chocolate chips, stirring until I got the right consistency. I have developed a "like" for spicy food. It has been fairly recently that I have enjoyed spicy food more than I used to. This is one spicy sandwich. 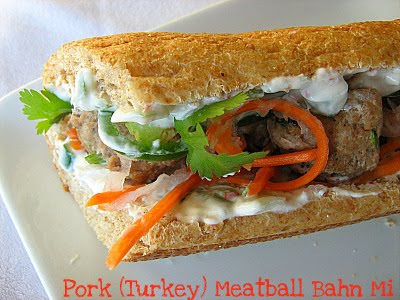 I have never had a Banh Mi, so I am definitely not an expert on what they are supposed to look like or taste like. I saw this recipe for a Meatball Banh Mi in a recent issue of Bon Appetit and I thought it looked delicious, plus it was really interesting. I used lean ground turkey for the meatballs and greek yogurt instead of mayo for the hot "mayo" spread. I also used a whole wheat baguette for my sandwich. This sandwich definitely had a really spicy hot bite to it, but it was really tasty! I really liked it and I thought of my younger sister when I took that first spicy bite because she would love this sandwich. 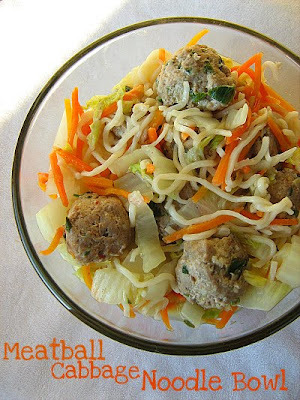 For the noodle bowls, I just sauteed a big head of napa cabbage and some matchstick carrots, then added that to some noodles and topped it with the meatballs. If you like spicy sandwiches or love Banh Mi, you will definitely want to try this recipe. Or if you just are intrigued and want something new for dinner- give it a shot! For St. Patrick's Day this year we had our usual green food, but I also wanted to try something that was naturally green. 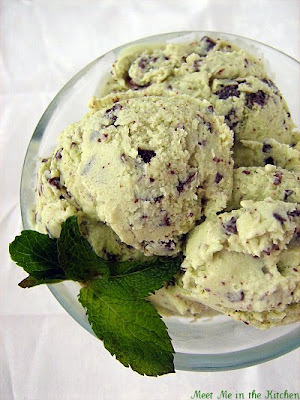 I had a ton of mint leaves and found this recipe for Mint Chocolate Chip Ice Cream, which looked absolutely delicious and sounded fabulous. I made the custard and when I reached for my ice cream maker, I realized I had forgotten to freeze the canister. I could have just put it in the freezer right then and let the custard hang out in the fridge for a day, but we had to eat the green ice cream that night!! That's when these instructions came to the rescue. 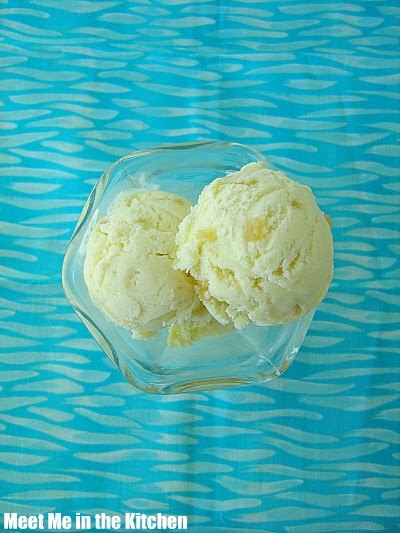 This ice cream is proof that this method works- You can make creamy ice cream without an ice cream maker. The mint flavor in this ice cream was better than any other mint flavored ice cream I have had. It was completely different from store bought mint chocolate chip, but tasted so real. My kids LOVED it. Hubs wasn't a fan, but the rest of us didn't care! More for us. 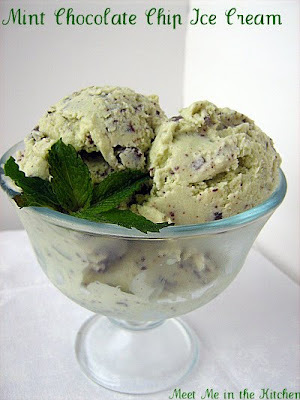 If you are familiar with fresh mint and like the flavor, I highly recommend this ice cream. Plus, it has a beautiful light green color that comes completely from the leaves themselves. The flavor was so clean and refreshing. This ice cream was a winner for us in every way. I am always looking for ways to make green salad more exciting. Adding different vegetables and legumes is one way of doing this. 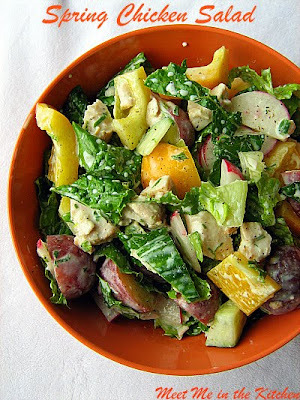 I saw this recipe in a cookbook and loved the idea of a light dressing with lemon juice and cumin. These flavors meld really well together. The option was given to add olive oil to the dressing, but I left it out, just to keep it a little bit lighter, and it was really good without it. Tart and lovely. One of my favorite things about spring and summer is that I crave salad all the time. This is one that I will be adding to the regulars. 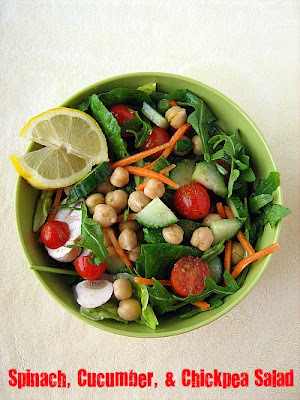 In the bowl you'll serve the salad in, whisk together the lemon juice, cumin, salt, and olive oil. Add tomatoes, cuke, scallions, chickpeas, parsley and mint. Toss to combine. Add salad greens and spinach. Toss, taste, adjust seasonings, and serve. * If you want to up the good calories, shredded carrots and diced mango are really delicious in this salad. You could also top it with thinly sliced grilled flank steak or chicken. Or serve it over bulgur. 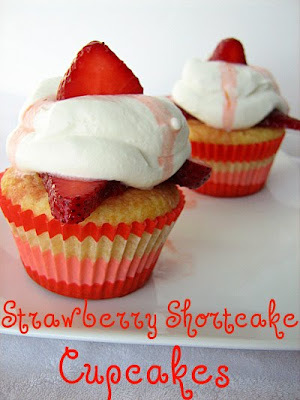 I made these cupcakes recently because strawberries are in season and strawberry shortcake is such a fun way to enjoy strawberries for dessert. My husband loves it and this just upped the fun factor by making it a cute cupcake. My kids helped me mix the cupcakes up and stir together the strawberries. I added some lemon zest to the strawberry mixture and it really just added a nice, extra zesty layer of flavor. I think the cupcakes would have been a little dry on their own, but they were absolutely perfect for soaking up the strawberry juice. Hubs and kids loved this dessert, which made it a winner for me too. 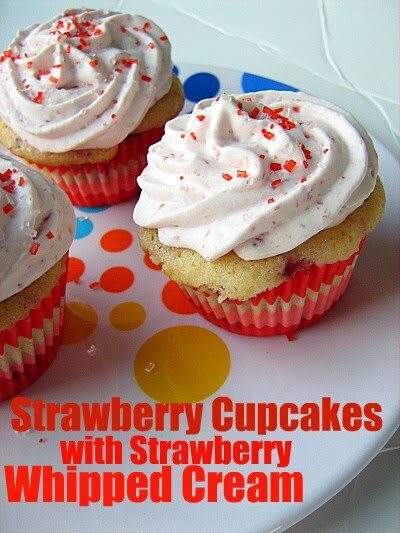 Plus, with such delicious strawberries right now, it makes this a quick and easy treat. I was so excited when I saw this menu in a recent issue of Bon Appetit. It was in the little section of the magazine where they always include a family friendly menu and fun ways to use the leftovers. 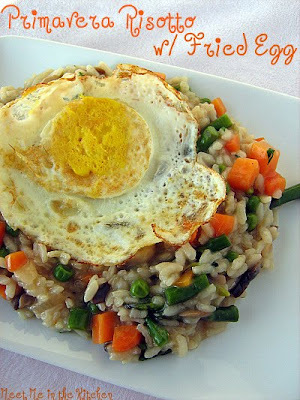 I love risotto and this version seemed really fun with all the vegetables, topped with the fried egg. I included the recipes because I changed each of them a little bit. I used whole wheat pitas to make the pitas chips, I reduced the amount of oil in the salad dressing and made a few changes to the risotto that made it a bit healthier, mostly by reducing the amount of butter and oil. Risotto is so delicious and can be made with just a tablespoon of oil or butter- it still turns out creamy. I really wanted to use the leftover risotto and make the risotto cakes recipe that they included, but we ate it as leftovers instead because it was so good! Any of these dishes would make a great addition to an Easter meal. The edamame dip was so good! I added some garlic to it, just to up the flavor and wow- that is really a great dip. If you like edamame, I am sure you will love it. The basil is such a great flavor enhancer. It would be great as a spread for a sandwich too. I was a little bit worried about this salad made with fennel, mainly because I have never had fresh fennel. I knew that it had a anise/licorice type flavor and that is one of my least favorite things. I decided to go ahead with it and give it a try and I am so glad I did. The celery and the fennel were really yummy. Nice and crunchy. With a little lemon juice and olive oil and the pumpkin seeds- it was amazing. It really surprised me. The risotto was perfect. 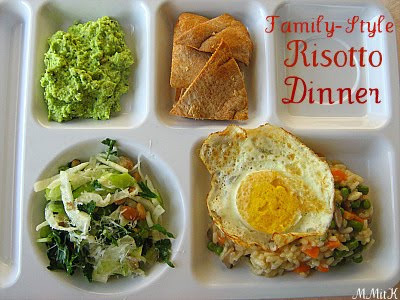 I liked the kid-friendly vegetables and it was really fun to top it off with a fried egg. Of course, I had to cooked my yolks all the way, because we don't do runny here. But you can top it off however you want. This was such a fun menu! It turned out perfectly and was so delicious. Place edamame, oil, garlic, and 1/4 cup reserved cooking liquid in processor. Blend until smooth, drizzling in 1/4 cup cooking liquid and lemon juice. Season dip with salt and pepper. Blend in more cooking liquid by tablespoonfuls if too thick. Add minced basil; pulse until basil is just mixed in (do not puree). Transfer dip to bowl. 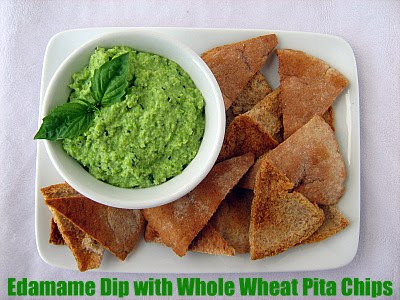 Garnish dip with basil sprigs; serve with pita chips. 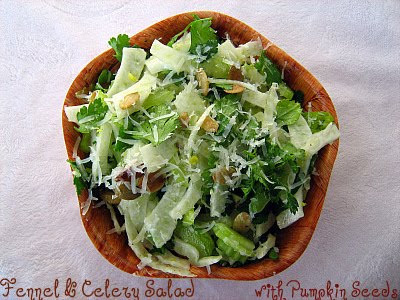 Combine celery, fennel, parsley, and pumpkin seeds in large bowl. Whisk oil and lemon juice in small bowl. Season with salt and pepper; toss with vegetables. Toss in most of cheese; top with remaining cheese. Melt 1 tablespoon butter in medium skillet over medium-high heat. Add mushrooms; sauté until tender, about 5 minutes. Season mushrooms with salt and pepper. set aside. Heat 1 tablespoon oil in large pot over medium heat. Add onion; sauté until beginning to soften, 5 minutes. Add garlic; stir 1 minute. Add rice and stir until translucent at edges, 3 minutes. Add 1/2 cup broth. Stir until liquid is absorbed, 1 minute. Add 1 cup broth. Simmer until broth is absorbed, stirring often, 3 to 4 minutes. Add carrots, asparagus, and 1 cup broth. Simmer until liquid is absorbed, stirring often, 5 to 6 minutes. Continue to add remaining broth, 1 cup at a time, until rice is just tender and mixture is creamy, stirring often and letting almost all liquid be absorbed after each addition, about 25 minutes total. Stir 1/2 cup cheese, peas, parsley, and mushrooms into risotto. Season to taste with salt and pepper. Heat 1 tablespoon oil in large skillet over medium-high heat. Cook eggs, without turning, until whites are cooked through and yolks are cooked to desired doneness. Mound 1 cup risotto on each of 4 plates. Using back of spoon, make hollow in top of each mound. Top each with egg.